In his psychiatrist's office, Superman is questioned vigorously by his doctor. She asks him who Superman is. Superman blanches, then tells her that he's a hero with powers far beyond those of normal men. He is powerful, and he takes care of everyone. Flash to Superman telling her about pulling Stryker's Island out into space. Superman tells Warden Pike, now inside the prison, that the JLA technology will now help them keep this satellite prison in line, and Superman tells the prisoners that if they step out of line, he will personally bring things back to normal. They clear the room. Back in therapy, Superman avoids the fan, and avoids the question from his therapist, as well. He doesn't want to answer who Superman is. He tells her he's using what Lois calls his Super-Deflecto Breath. Asked why he's discontinuing therapy, he tells her about the incident with Manchester Black, and how Lois was harmed rather brutally. The scene cuts to Clark comforting her after the event, promising not to leave until she's fine. Inside the apartment, Martian Manhunter awaits with Snickerdoodles, ready to give Lois her mind-scan. He goes on, telling and showing how his family, Ma and Pa, reacted to the affair, with both Pa and Clark blaming themselves for letting the situation get too far out of hand, for not being able to protect each other. Who is Superman? She demands. He tells her that sometimes he is someone who fails. Not often, but when he does, it is hard. He tells her about how he still questions what happened to the parallel Zod, the one he executed with his cohorts, long ago. He tells her he's sure that the new Zod is not the old Zod, but he still questions his actions, and whether or not he can handle the new Zod. He then tells her that since he had the chance to kill Manchester but didn't, he's stopped having nightmares about killing Zod. Who is Superman? She asks. The bell rings, and his time is up. He thanks her, hugs her, and they leave on pleasant terms. On the television, Zod watches, and realizing that Superman has changed his shield and come back to a level of normalcy in his life, it is time to strike and destroy the Man of Steel. Story - 4: Finally! Someone realizes that leaving a whole bunch of baddies in an easily escapable prison near the heart of a major metropolitan era is foolish! When the prisoners leave the room, I didn't buy it. Superman doesn't scare criminals, except with, say, his killing sprees of late. Batman says "Boo" and people have heart attacks. Superman says "Boo", and even seasoned veterans of battling Superman laugh, because he doesn't lurk in the shadows and we can see that his underwear is outside of his pants. The problem with this issue, from a comic book perspective, is that it does several things that estrange most readers. First, it summarizes something that we just saw. Second, it shows Superman as a vulnerable, human, suffering man in a hostile world, as opposed to an invincible knight, unscathed and passionate in his quest. I actually prefer the vulnerable Superman, however, so this agreed with me to an extent. I'm not sure I liked so much the summary, but to see at least that the actions of recent books have had consequences, in retrospect, is highly rewarding. Now just get Superman to discuss how sloppy he was in cleaning villains up in Ending Battle, up to and including seemingly killing, and we'll be in good business in terms of explanation. 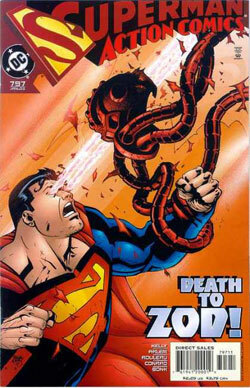 The benefit of this issue is that it isn't merely Superman beating the crap out of everything in sight, which is a must in most issues, but it's usually done rather bluntly, and without a good deal of thought into the consequences of the actions. This book is the antithesis of that, an examination of said consequences, and I respect that. Most of the books of late have been rather vignettish in a self-contained way, but they involve things that aren't really of major import in the large battle of truth, justice, apple pie and etcetera. Here we have Superman talking of Ending Battle, a landmark in his life (well-played by the writers or not), and regards the coming major event, the resolution of Zod. In this, we have forward motion, something a lot of the comics have lacked lately. For this Superman's failures of story of late are not redeemed, but this particular issue was well-put and enjoyable to me. Art - 3: Well, there was some interesting stuff, but rough hewn is not the kind of Superman I like. I'm more of a Ferry, McG, or Grummet man myself. Something a little cartoony, but also serious in its own way. This grim, textured, bitter looking Superman has become a staple, and it works, but it's not my favorite way of seeing Supes. Is it well drawn, and does it convey the story? Yes. But does it bring anything special? Not really. Average. Cover Art - 2: I have to give this one its fair chance. If it's referring to the dreams that Superman has been having, as it might be, and symbolically representing what's to come, then it is a five of five, evil logo aside. It's captivating, exciting in its pose, and it's got a great color scheme. Thus the bonus 2 instead of 1. The background is all one color. The scene didn't happen in the book. Superman looks like he's passing gas, or about to. The logo is still there. And "DEATH TO ZOD! Ooh, I get shivers. But not goosebumps. The shivers you get when you see a puppy kicked. That's so cheesy, it's almost no gouda. It's like putting "AND ONE SHALL FALL!" or "BEWARE THE GRUNDY!" on a cover.